Unfortunately it looks like that, without reinforcement, White can get Black's eye down to the bulky five shape. 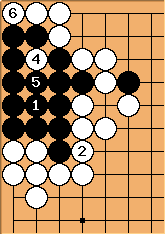 So Black is dead if White goes first. Black has four internal ko threats (a, b, c and d) here, while White has none at the moment. So she will not try to kill by this method immediately, if this is the only way. White will play very insolently in other parts of the board, accumulate some ko-threats, and then will return here. Jasonred I'm a very dumb Go player, I don't see how White stops Black living with a ladder. You smart players, you teach Grimlo... errr, Jasonred? Actually, I think is the wrong response. Should it go , White a, , White b, Black c? But that looks like an even worse outcome for White? unkx80: should play at c.
Jasonred : Now what? Is a possible eye for Black? If so, how does White stop Black getting it? Can't Black manage one more eye somewhere? I'm hopeless, but it looks to me like a reasonable number of liberties, and enough space... come to think of it, is a possible eye? 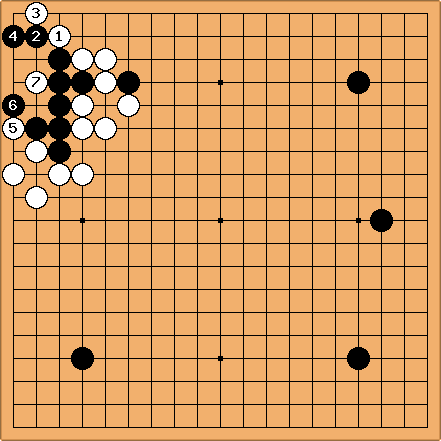 Even if White could win the ko, it would be worth only around 10 points, miai counting. Since it is Black's move, he should tenuki. 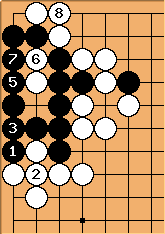 Also note that if White had connected below with , she would have allowed Black to live by playing at . With at , Black is gone. 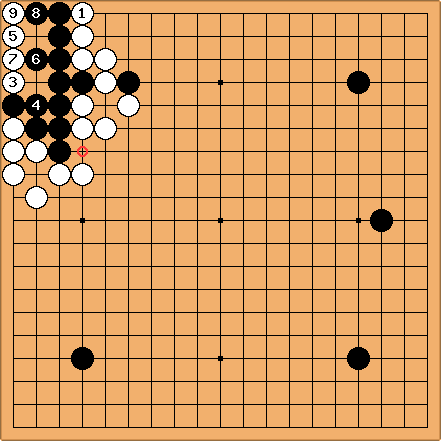 Here, Black definitely lives. --FCS is not needed? Too small? Due to blacks outside liberty, this is not a seki. Black can play atari and live unconditionally. unkx80: Without , it is seki.